In "Adventure Around the Corner“ we have developed and implemented a new and so far unique format for documentary nature films for children and young people. The pilot film, which has already been produced, consists of three 20-minute episodes. Because of the positive response to the pilot film, it is being followed up with a series of documentary films. 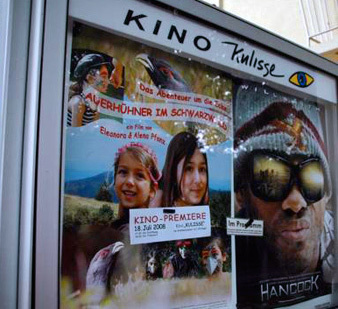 The shooting for Parts 5, 6 and 7 has been completed, and Part 4, “Capercaillies in the Black Forest“, which has been finished and is available on DVD, celebrated its premiere in Schonach on April 8, 2008. This was followed by the film premiere on July 18 in Ettlingen, which was attended by a group of enthusiastic young fans and a large number of other visitors, as well as representatives of the media, Ettlingen Mayor Ms. Petzold-Schick, and State Parliament Member Werner Raab. We are pleased to announce that the new part of “Adventure Around the Corner“ is now available on DVD and can be ordered from Planet Film for only €15..
“Capercaillies in the Black Forest"
We are pleased to announce that the new part of “Adventure Around the Corner“ is now available on DVD and can be ordered from Planet Film for only €15. The Brent Spar DVD is finished and can be purchasable ordered at Planet Film.